Upgrade your style routine with new Fructis Style pomade, putty and cream that come in liquid-formats. 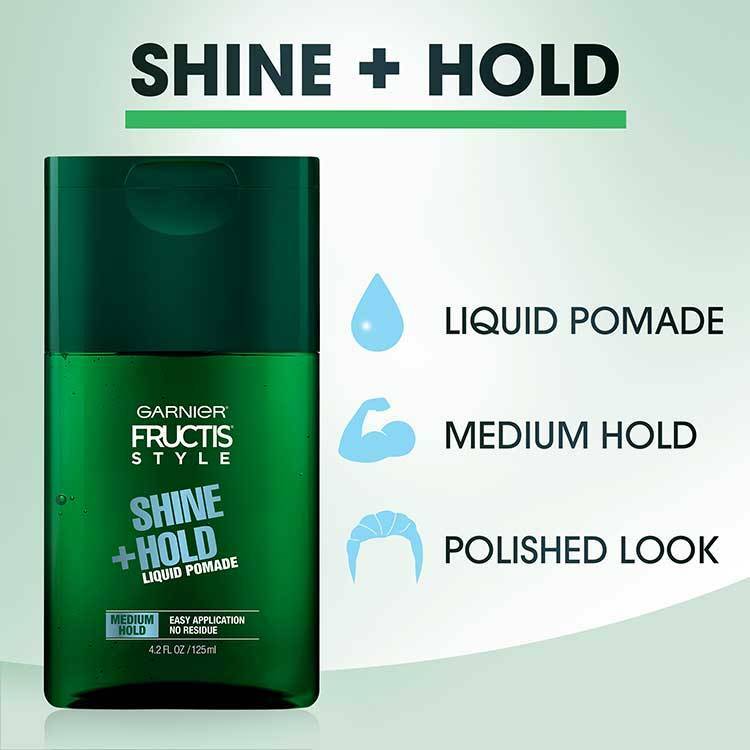 Fructis Style Shine and Hold Liquid Pomade for Men is a liquid-format hair pomade that gives you a polished, clean look with medium hold. 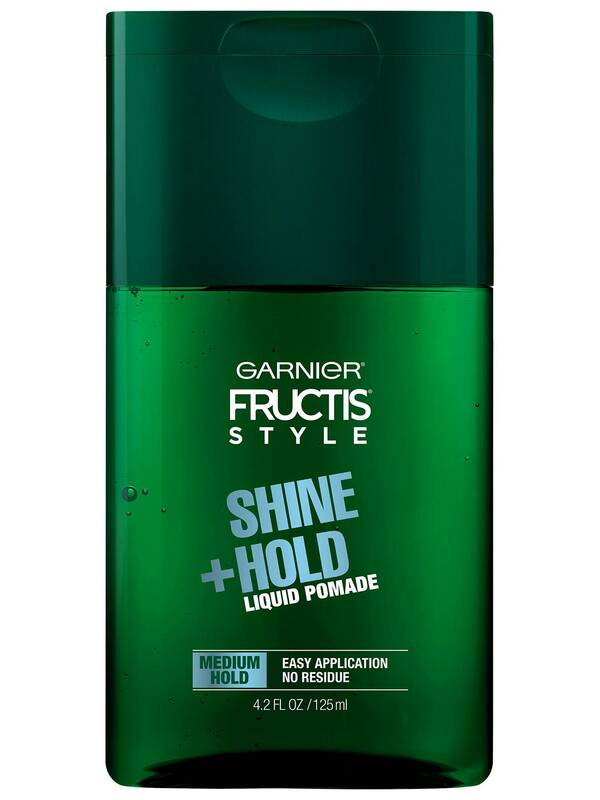 Garnier Fructis Style Shine and Hold Liquid Pomade for Men makes application easier than ever, and gives you a no residue, clean touch for 100 percent clean style for with an upgraded routine. Fructis Style Shine and Hold Liquid Pomade for Men upgrades your style routine by giving you all the hold with no messy application, no grease or clumps, no dosage mistakes, no build up, no residue, and no drying alcohol. Upgrade your routine with Fructis Style pomade, cream and putty that come in liquid-formats, and for best results use on damp or dry hair after shampooing with Fructis Grow Strong Cooling 2in1 for Men. 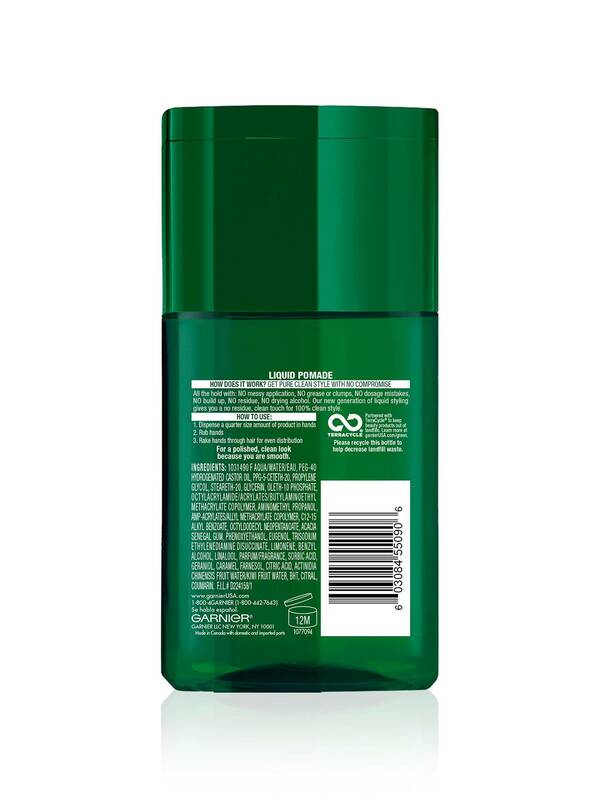 Dispense a quarter size amount of Fructis Style Shine and Hold Liquid Pomade for Men in hands, rub hands together, then rake hands through hair for an even application and a polished clean look. Apply on damp hair for best results. Rated 5 out of 5 by spencerc3 from Great product!!! Easy to apply. Long lasting. Great quality. I really like this product. I use both at home and in salon. Rated 4 out of 5 by taylore5 from Amazing product and such an amazing part of my everyday life!! It is super affordable, get ingredients, and safe to use! I found it affective for what I was needing, and I will continue using it and recommend it to everyone! Rated 4 out of 5 by ErinC1 from Excellent, innovative new product! I tried this liquid pomade and it stands up to the competitor! This product provides excellent shine and flexible hold. Rated 4 out of 5 by Jessthemessblog from Great smell! My husband loves this gel! It holds while still looking natural! On top of the great hold it has it smells sooooooo good!!! I love it! It's a refreshing like smell! The texture is definitely different, pomade i usually think of a waxy like feel but this is liquid which is definitely easier to work with!